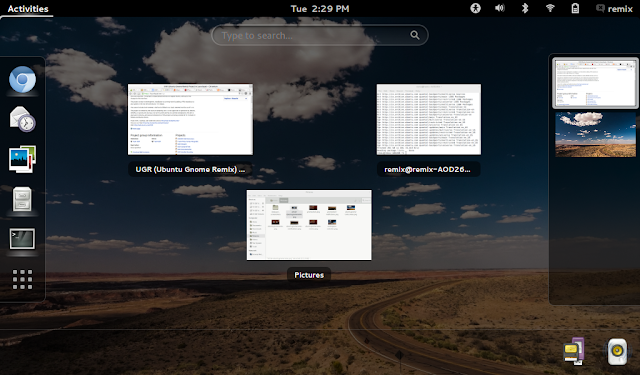 If you want the best of GNOME Shell and Ubuntu, there is no competition, Ubuntu GNOME Remix it is. We concluded our earlier review of Ubuntu GNOME Remix with the "best distro for Netbooks" title. It seems like a lot of people do agree with us. Ubuntu GNOME Remix has been renamed to just "Ubuntu GNOME" and is now an official Ubuntu spin, joining the likes of Lubuntu, Xubuntu, Kubuntu, UbuntuStudio, Mythbuntu and Edubuntu. Ubuntu GNOME Remix is now an Official Ubuntu Flavor! "We are pleased to announce that Ubuntu GNOME is now an official Ubuntu flavour. We recently applied to the Tech Board to become an official Ubuntu flavour and the Tech Board approved our request at their most recent meeting", devs announced in a recent blog post. The first release of Ubuntu GNOME Remix aka Ubuntu GNOME was based of Ubuntu 12.10 and it was pretty popular among the aficionados. The second major release of Ubuntu GNOME will be based out of Ubuntu 13.04 "Raring Ringtail" and it will be released with GNOME 3.6, since Ubuntu held back on GNOME this cycle.